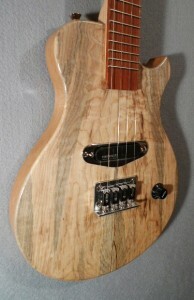 This is a New Spalted Hard Maple Electric Ukulele . The wood came from a very old tree from a remote island in the San Juans. This and all my ukuleles are hand made in America. Most all the wood used in Monkey Wrench Ukuleles are grown the USA . The fret boards are made from Jatoba (Brazilian Cherry) which is a sustainable growth hardwood and is not endangered. Jatoba is an extremely hard wood it wears well and makes for a great fretboard. This is a quality instrument and is made to last. I am currently building a Baritone model and a long scale Tenor. Both will have the same quality features with added tone controls and adjustable truss rods. The truss rods are needed with the longer 21-1/4″ scale on the baritone. If you have any questions about this or other ukuleles Please email me. This ukulele is for sale.